Helical Geared Motors In line to meet utmost satisfaction of customers needs, we are manufacturing and exporting an extensive range of Helical Geared Motors. These motors are widely checked on various parameters to ensure its quality, safety and efficiency. It is manufactured by our experienced team using tested quality material sourced from certified vendors in the market. The available motors can be customized in different models and specifications to meet the diverse requirements of the clients. We are offering these Helical Geared Motors at pocket friendly price to the clients. We are highly engaged in offering our clients a wide range of Helical Geared Motors. 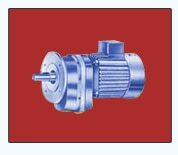 These geared motors are applauded among customers owing to its efficient units to attain slow speed. Offered Helical Geared Motors are developed by utilizing optimum quality material and contemporary techniques in compliance with set standard. Our Helical Geared Motors are suitable for drive tasks where an angular geared motor with high power density is needed. Heavy Duty Rotary Vibrators Being a quality conscious unit, we are highly indulged in fabricating and offering an extensive range of Heavy Duty Rotary Vibrators. This Heavy Duty Rotary Vibrators is designed under the guidance of senior professionals using finest quality material and latest techniques in strict compliance with international quality standards. The offered Heavy Duty Rotary Vibrators are widely used in pharmaceutical and chemical industries for feeding and screening. Our clients can avail these Heavy Duty Rotary Vibrators at pocket friendly price from us. Vibrating Spiral Elevators Being a quality conscious unit, we are highly indulged in fabricating and offering an exclusive range of Vibrating Spiral Elevators. These Vibrating Spiral Elevators are used in various industries such as food, feed, chemical and pharmaceutical. Manufactured by using tested quality materials and advance techniques, the offered elevators are specially designed for vertical elevation and provide silent operation. These Vibrating Spiral Elevators are strictly tested on various parameters to ensure its flawlessness. We offer these Vibrating Spiral Elevators at suitable price to the clients. Our organization is counted among the leaders in manufacturing and supplying Vibrating Spiral Elevators. Provided spiral elevators are use in various industries such as food, feed, chemical-technical and pharmaceutical industry. These spiral elevators are developed utilizing best quality material and advance technology in accordance with set guidelines. Moreover, these spiral elevators are highly accredited for their reliability among our patrons.